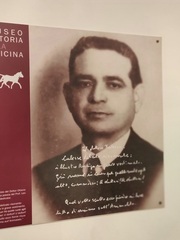 Ottavio Badessa was born in 1898 in Bauso, current Villafranca Tirrena. He graduated in Medicine in Naples and then he attended the Obstetrician clinic in Messina. We remember him while he goes to visit the sick, moving tirelessly with his buggy which, for this reason, has been chosen as a symbol of the Museo di Storia della Medicina Dr. Ottavio Badessa. - AA.VV.,Museo di Storia della Medicina Dr. Ottavio Badessa, Soc. Coop. Cardamomo, Villafranca Tirrena 2013, pp. 1.